Two quick things today (6/10/2014). 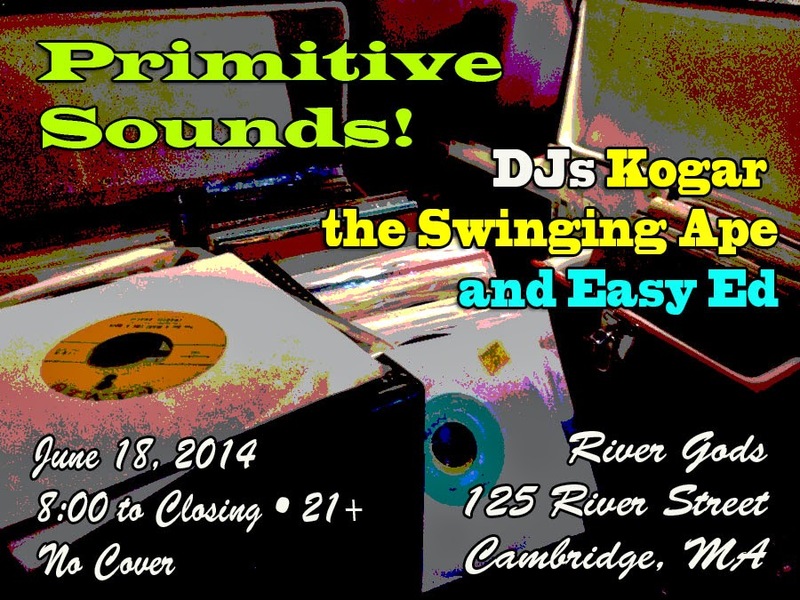 As you may already know, I cohost a regular roots-music DJ night called Primitive Sounds in Cambridge, MA. My cohost is P.J. Eastman. He and Jason Beek started Primitive Sounds about ten years ago and we've been keeping it going ever since. The venue is River Gods (125 River Street) and we spin records--the same kind I play on my radio show--from 8:00 to 1:00 on the first and third Wednesday of each month. Each night features sets by one of the hosts (me or P.J., or sometimes both of us) and a special guest DJ. River Gods is a friendly little room (official capacity 60 patrons) with a DJ booth that overlooks the bar and dining area. They serve tasty food and drinks. For our next night, June 18, we're thrilled to have Kogar the Swinging Ape back as our guest. 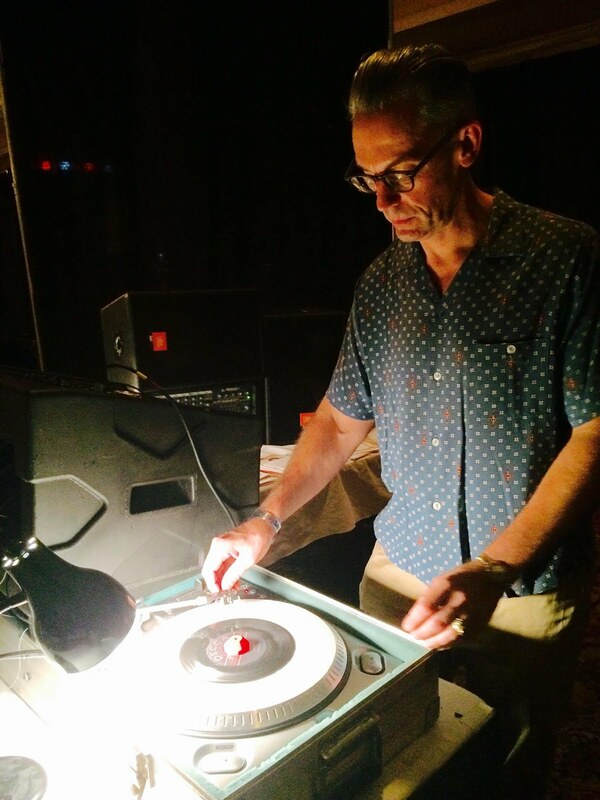 Kogar is one of my all-time favorite DJs, and he spins the coolest 45s on this or any other planet: rockabilly, obscuro '50s rock 'n' roll, awesome instros, and much more. (See his blog for more info, and for links to his podcasts. I'm really looking forward to next week and hope to see you there! This week we also relaunched the easy-ed.net site and it looks terrific. (It's also much easier to use now if you want to, e.g., download podcasts of previous shows.) Big thanks to Beck Rustic for the design and to my wife Beth for doing all the technical stuff. That's all for now. Keep rockin'! Start your 2014 summer season off right at this huge rockin' show at the fabulous Midway in Jamaica Plain, Mass! 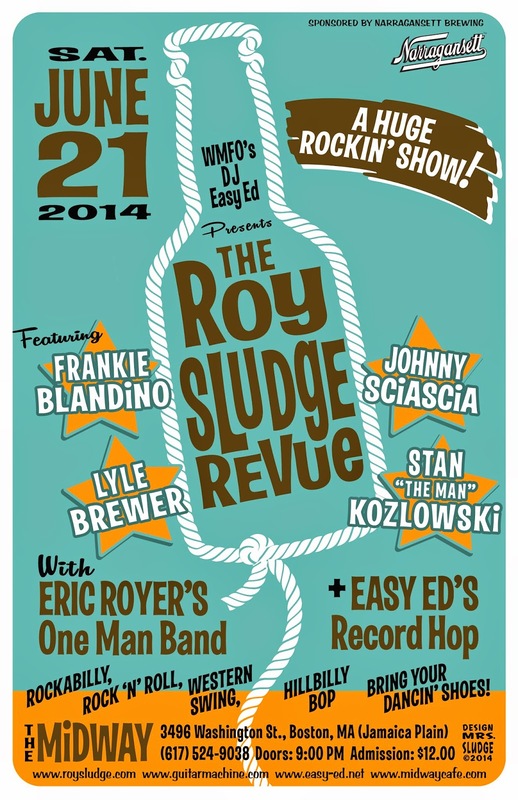 This very special Roy Sludge lineup picks up where Boston's legendary Spurs left off and features Frankie Blandino (Cranktones, Fathoms) on steel; Johnny Sciascia (Cranktones, Eilen Jewell Band) on bass; guitar phenomenon Lyle Brewer; Stan "The Man" Kozlowski (Cranktones, Barley Hoppers) on drums; and, of course, the great Roy Sludge on lead vocals. The astoundingly outstanding Eric Royer's One-Man Band opens the show, and DJ Easy Ed will be on hand to spin records early, late, and on the breaks. What: A Huge Rockin' Show! See the Facebook event page for this night for additional details and updates. Advance tickets are available (and recommended--don't end up listening from the sidewalk). Generously sponsored by Narragansett Brewing.